So Smith asserts as a matter of empirical fact that there are common moral emotions and feelings — sympathy, pity, compassion — that underlie human social and moral behavior. And the most basic kinds of morally motivated behavior — altruism in particular — are explained by the workings of these natural emotions of empathy with other human beings. So Smith posed a fundamental question: is there an innate human moral psychology, beyond the reach of training and teaching, that accounts for our willingness to give to others and sometimes sacrifice important interests for the good of others? Why do firemen rush into the highly dangerous environment of a large fire in order to rescue the people inside? 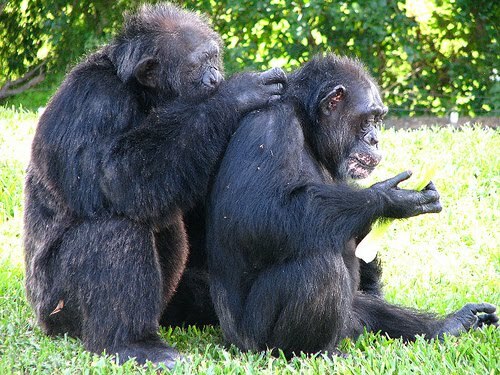 Now fast-forward to the post-Darwinian world; look at the human organism from the point of view of the study of primate behavior; and ask this key question: Is there an evolutionary basis for social behaviors? Are there emotions supporting cooperation that were selected for through our evolutionary history? Is a moral capacity hardwired? Philosophers have treated this question in the past. Allan Gibbard’s Wise Choices, Apt Feelings: A Theory of Normative Judgment is a particularly good example. Here is how Gibbard describes the situation. This is the part that seems counter-intuitive from a simple Darwinian point of view. Wouldn’t an organism possessing a genetically determined disposition to act contrary to its mortal interests almost necessarily have less reproductive success? So shouldn’t such a gene quickly lose out to a more opportunistic alternative? Gibbard considers the evolutionary arguments surrounding the topic of altruism (including Richard Dawkins’ Selfish Gene ), and concludes — not necessarily. It is possible to mount an evolutionary argument that establishes the fitness-enhancing characteristics of some specific kinds of altruistic behavior. So what does the current research on this topic add to what we already knew? And, can we draw any interesting connections back to the venerable Smith? Human toddlers adjust their cooperative and normative behavior to be more attentive to the behavior of others: generous to the generous and not to the ungenerous. Human infants and toddlers have a precultural disposition to absorb and enforce norms. The emotions of guilt and shame to be hardwired to conformance to norms. Infants appear to take a “we” intentional stance without learning. They are able to quickly figure out what another agent is trying to do. Chimps differ from human infants in virtually each of these areas. Here is a particularly interesting piece of evidence that Tomasello offers in support of the idea that human evolution was shaped by selection pressures that favored social coordination: the whites of the eyes in the human being. Almost all non-human species have eyes that are primarily dark; whereas human eyes feature a large and conspicuous circle of white (the sclera). The whites of the eyes permit an observer to determine what another individual is looking at — allowing human individuals to achieve a substantially greater degree of shared attention and coordination. “My team has argued that advertising my eye direction for all to see could only have evolved in a cooperative social environment in which others were not likely to exploit it to my detriment” (76). So does this recent work on the evolutionary basis of moral emotions have anything to do with Smith and the moral sentiments? What the two bodies of thought have in common is the idea that there is a psychological foundation to moral behavior, cooperation, altruism, and helping. Pure maximizing rationality doesn’t get you to “helping”; rather, there needs to be some psychological impulse to improve things for the other person. Where evolutionary psychology differs from Smith is precisely in the nature of the explanation that is offered for this moral psychology; we have the advantage of having a pretty good idea of how natural selection works on biological traits, and we are therefore in a better position than Smith was to explain why human beings possess moral sentiments. What we cannot yet answer is the question of the nature of the mechanism at the level of the central nervous system or the cognitive system, of how these moral sentiments are embodied in the human organism. Really nice review of a fascinating and important area of research. Thanks Dan! In my pile of things to reread (because I haven't really absorbed them) is a John Searle essay – Social ontology: some basic principles and Colin Renfrew's Prehistory – Making of the Human Mind.While reading this post I remembered that Searle(and his earlier book it is an appraisal of – The construction of social reality) relies very much on the idea that language or at least a system of symbols is a pre-requisite for institutions with deontological power i.e. morality.Renfrew start from looking at archaeological and other fossil data posits what he calls the sentient paradox – our genetics doesn't seem to have changed significantly from carbon dating records for some 60 000 years while the archaeological record shows no signs of human culture (or sentience or things to act as shared symbols as in language) before 40 000 years ago or even less so he raises the question if that is the case what is it that we think of as being our psychology? What was happening to our genetics which gave it propensities to have deontological symbolic systems of social understanding long before it seems to have made any use of them?This presumably indicates that there is another line of reasoning here even in a post Darwinian context – genes are not for something, or at least not necessarily so, when they are they usually have accidental effects, of which our linguistic/symbolic capacities including deontological social behaviour might be an example. I think this line is developed by Stephen J Gould, at least the accidental gene thing. So here there is a line of research which asks, if the sentient paradox is placed beyond question (I have no idea if it is or not) what causes the expression of these latent capacities? What Renfrew suggests (this is going on hazy memory) is that it arises from the development of technology. This is socially mediated and acts as a symbolic basis for the development of ever greater possibilities for human action, greater abstraction etc, and by extension (using Searle's idea) morality as a result. I think the issue for evolutionary explanation is often wrongly posed. As Adam Smith noted, we are extraordinarily social ("altrustic" in evolutionary terms). The question is not whether we are here, but how did we get here. Natural selection is a process, not a rule – it makes some places hard to reach, and others easier. Our very rarity as an over-brained, talking, hyper-social animal suggests ours was a hard place to reach. yet here we are nonetheless.Renfrew – and many others – ignore the evidence from Australia when looking at the emergence of modern traits. People came here at least 50,000 years ago, with art, language and all the rest. Since they left Africa at least 75,000 years ago, and it's hard to see how a genetic change could propagate backwards from Tasmania to South Africa in the few tens of thousands of years before some populations were isolated by sea rise, it follows that we left Africa with all the paraphernalia of the modern mind. Bits of archelogical evidence are now turning up to confirm this (eg recent finds of decorated ostrich shells in South Africa). But it prety much had to be the case. Absence of evidence is not evidence of absence, my history teachers used to say. Hi-I would propose mirror neurons as a probably mechanism for how this subject is embedded in the central nervous system. I would point to http://www2.unipr.it/~gallese/Gallese%202001.pdf in particular, as an exposition of the idea.Thanks for posting. This is one of the more challenging blogs I read intellectually, and I appreciate it.